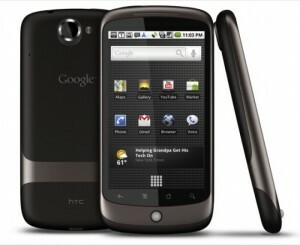 Google in collaboration with an Original Equipment Manufacturer (OEM) partner introduced the Google Nexus cell phone. It is based on android operating system and is one of the few devices that are being recommended for Android software development by the Android Open Source Project. Height: 4.7”, Width: 2.35” and Thickness: 0.45”, having a weight of 130 g.
Its processor is 1 GHz Qualcomm Scorpion and memory is 512 MB. Built-in storage memory is 512 MB with, expandable up to 32 GB. Battery power is 1,400 mAh Li-ion. It has just a rear camera of 5 MP, with video recording facility. Some other features may include: multi-touch capacitive touch screen, ambient light sensor, microphone, proximity sensor, trackball. Height: 4.88”, Width: 2.48” and Thickness: 0.43”, having a weight of 129 g of AMOLED version and 140 g in the Super Clear-LCD version. Its processor is 1 GHz single-core ARM cortex-A8 and memory is 512 MB. Built-in storage memory is 16 GB with no card slot option. Battery power is 1,500 mAh Li-ion. The rear camera is 5 Mp and the front camera is 0.3 MP. Some other features may include: capacitive touch-sensitive buttons, digital compass, Wi-Fi hotspot, USB tethering, SIP VoIP. Height: 5.33”, Width: 2.675” and Thickness: 0.352”, having a weight of 135 g.
Its processor is 1.2 GHz dual-core ARM cortex-A9 and memory is 1 GB. Built-in storage memory is either 16 GB or 32 GB with no card slot option. Battery power is 1,750 mAh Li-ion in the HSPA+ version whereas 1850 mAh in the LTE version. Some other features may include: Barometer, 3-axis Digital compass, dual microphones, Wi-Fi direct and oleophopic display coating. The screen is of this device is 4.7” with Corning Gorilla Glass 2 touch screen. The device has a 1.5Ghz Qualcomm Snapdragon S4 Pro APQ8064 quad-core processor, 2 GB of RAM and comes in either 8 GB or 16 GB built-in memory with no option for card slot. The rear camera is 8MP, whereas the front camera is 1.3MP. It is capable of wireless charging and has a crystal reflection glass. Height: 5.27”, Width: 2.7” and Thickness: 0.36”, having a weight of 139 g.
A battery of 2100 mAh rechargeable lithium polymer. The Nexus series doesn’t only constitutes the smartphones but it also provides its users with other device like the tablets and the media streaming devices. These devices come with different versions of android system and have wonderful features.